A few years ago our book group read Trumpet by Jackie Kay. I’d organised an event with her at the library the previous year and still had her mobile number in my phone. We all loved Trumpet and we drank lots of wine, and late in the evening I thought it was a good idea to send her an enthusiastic text saying how much we loved the book. She texted back the next day saying she was pleased we’d enjoyed the book, but which Anna was this? I sent her an email from work apologising for my unprofessional behaviour and reiterating that we loved the book. She never replied, and I don’t blame her. 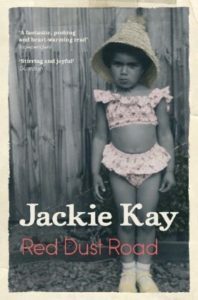 This time we were reading Red Dust Road, her memoir about looking for her birth father in Nigeria. I kept my phone firmly in my bag, which is probably a good thing as we didn’t love Red Dust Road as much as Trumpet. I think the problem is the genre. Jackie has an interesting story to tell. Adoption fascinates us all, and the idea of meeting up with a complete stranger who has given you their genes is irresistible. But what the group decided was that Jackie Kay is very aware that these are real people living real lives – not just her birth parents but also her adoptive mother, her father and her brother. As such, she doesn’t want to invade their privacy, doesn’t want to expose everything about them to the world, and only tells their stories when they directly impact upon her own Which is fair enough. Who would want to expose those they love to the scrutiny of the public? But it makes for less satisfying reading and makes the book seem ego-centric. In Trumpet, which was fictional, she didn’t have to worry about such things. Having said this, there were some beautiful passages of writing in Red Dust Road. In the best parts the writing is poetic and rich, and someone commented that this had been the case with Trumpet too. And of course, she is a poet so that is not surprising.